Penrith City Council General Manager Warwick Winn and Mayor Ross Fowler OAM pictured with Council’s new electric vehicle. Council is marking this year’s international Earth Hour event on Saturday by launching a new electric car. 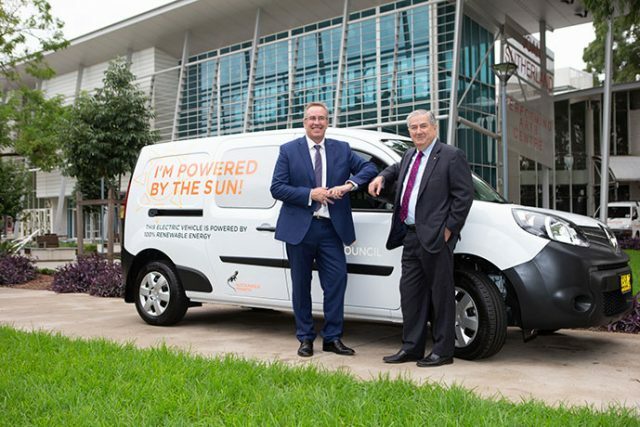 The latest addition to Council’s vehicle fleet is a 100 per cent electric Renault Kangoo, which will not create any greenhouse gas emissions while being driven, and will be recharged using renewable energy. The delivery-style ‘eco car’ has been purchased to trial its suitability and real world running costs, and if it proves successful Council will look at purchasing more in the future when cars need replacement. The Kangoo will be used by staff to transport items around the city and will be on display at various community events so local residents can learn more about this technology and see the car for themselves. Penrith Mayor Ross Fowler said he is excited that Penrith is one of the first councils in Sydney to have a fully electric vehicle as part of its fleet. “This is the latest in a range of steps we have taken to reduce our energy use and move towards renewable energy sources, as an organisation and a city,” Cr Fowler said. Penrith residents are encouraged to join millions of people in more than 180 countries in switching off their household lights from 8.30pm-9.30pm on Saturday, March 30. Visit earthhour.org.au to find out more.